How Far is The Lake Towers? At The Lake Towers your home flows elegantly across 4500 sft, dreatively structured to give you four elaborate bedrooms. 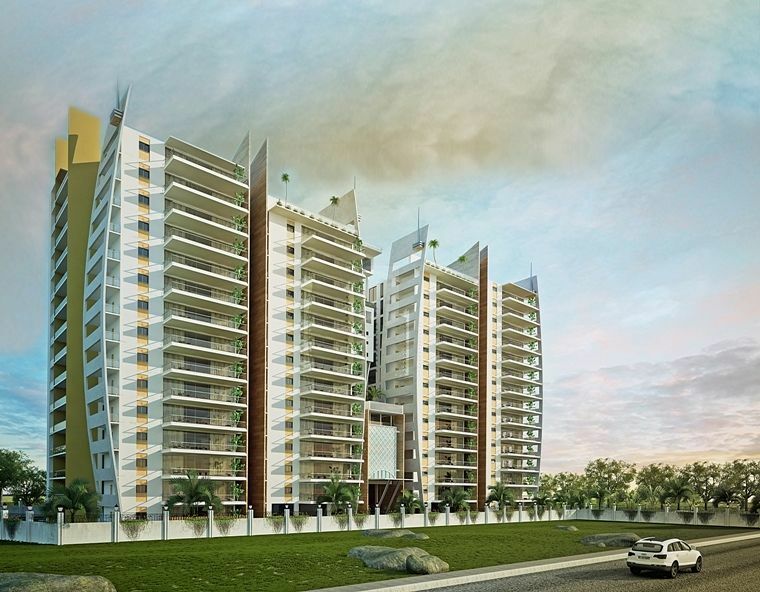 The Lake Towers is strategivally located just 25 minutes away the Rajiv Gandhi international Airport at Shamshabad-a district advantage in a rapidly growing city. It is also conveniently close to the finest malls, including Inorbit Mall, among the largest chain in South Africa. 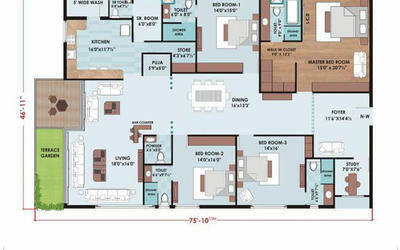 The Lake Towers also has an exclusive 10000 Sft. Club House that eatends across 14 floors, elaborately equipped for your health and recreation. Birla Shakthi / Ultratek / Penna Gold. Asian Paints / Nerolac Paints. ICP Weather shield. Smooth sponge finish plastered surface, treated with 2 coats of Birla Luppam putty, primer applied & 2 coats of Premium Acrylic Emulsion. Royal play / Metalic Glitter paint on feature walls in Bedrooms & Hall. Asian Paints / Nerolac Paints. Sponge finished, plaster admixed with water proofing compound and painted with weather proof paint of mentioned paint brands. Sandstone cladding & Texture paint at designated areas as per elevation design given by the Architect. High class mtr x mtr tiles in Hall, Living & dining areas for a rich look. 2*2 High glass, double charged vitrified tiles & laminated wooden flooring in master bedroom if architect finalizes. Anti skid full body rustic Vitrified tiles. Heavy quality hinges for main door and superior brass make SS finish hinges for internal doors & windows with required toerr bolts & stoppers. Superior quality branded latch handles in SS finish with Mortise locks. Conventional RCC platform with granite top & designer dadoing tiles upto 2.5 ft. height with branded sinks and 2 swan neck taps for GHMC & bire-water connections. Branded PVC medium duty conduits. Flame retardant, low smoke wires os ISI mark. Superior quality tube lights & fans as per flor plan necessity. Individual electric meters to be provided. CP Fittings superior brands in bathrooms, utility & kitchen with concealed diverters to give 5 star ambiance in bathrooms. Glass partitions with toughened glass for dry and wet bathrooms concepts in master and one children bed room. Granite design with suitable inlays and half molded / chamfered skirting for elegant lobby. 4 regular lifts with modern class SS finish lifts with granite designer cladding near lift entrance. One service lift of 2 tons in each block for luggage and maid servents. Automatic DG with Automatic changeover switch between main power & DG power with good power back-up system. Power back up to all tube lights, fans excluding AC's. Dazzle / Pavit make / Premier make. Designer, interlocking parking tiles as per architect's choice. 2 seperate water tanks for fresh water and bore water seperately connecting to each flat and one electric motor to lift from the underground tank. Water treatment plants as per requirement. Rain water harvesting and storm water pits to be made as per norms. 2 transformers of 300 kva shall be provided.